The Temple of Aphaia, inside pine trees, with beautiful sea view. The Old Palaioxora with many old churces. 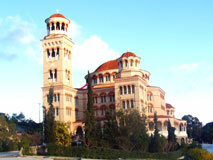 The Monastery of Saint Nektarios was built around 1904-1910 by the bishop Pentapoleos Nektarios. Nektarios lived in the Monastery and died in 1920. In 1961 he was declared a Saint. 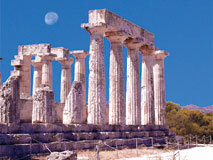 The Monastery is on the road to Saint Marina and it's about 6 kilometers away from the town of Aegina. The church has two tall bell-towers and 4 rows of windows which all have red archs for crowning. Το Fourteen nuns live in this Monastery. The Monastery celebrates on 9th November and thousands of people gather on this day from every part of Greece. There are many rows and dedications made from a great numberof worshippers in this Monastery. The temple of Athena Aphaia is built in the northern part of the island in a place covered with pine trees and with a view of the beautiful blue sea.It's in a very good condition. Twenty-four pillars of the temple remain, out of a total of 34. It has been built in 480 b.c. just after the naval battle in Salamina. Pafsanias gives us more information about Aphaia from some traditions in Crete.According to those, Vritomartis was born from Zeus and Karmi and because she liked hunting very much, Goddess Artemis was fond of her. Minoas fell in love with Virtomartis and in order to get away from him, she fell into the sea where she got tangled up in some fishermen's nets and they took her with them on their ship. But on the ship, a sailor fell in love with Vritomartis so she was forced to fall into the sea again in order to get away from him and she managed to swim to the island. The girl headed towards the forest of the island and the sailors watched her from the ship as she was vanishing with some kind of holy intervention and that's why they named her Aphaia from the word afandos which in greek means that someone has vanished into thin air. 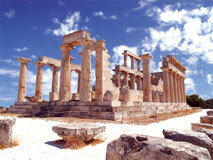 When the atmosphere is clear, you can see Poseidon's temple in Sounio and the Acropolis of Athens. It is said that the 3 temples form a triangle (the holy triangle of ancient times). 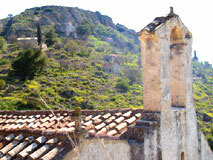 Palaioxora, today looks very much like a place called Mistra, with churches and ruins from houses. 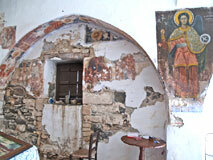 Only the churches have survived and the murals aren't in a very good condition. 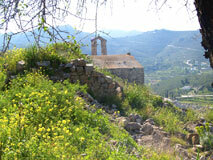 The church of Saint Nikolaos (13th century) is not very far from Palaioxora. 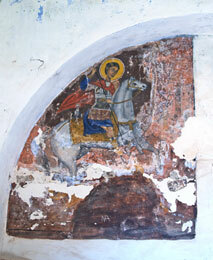 It has many murals some of which are dated back to 1330. 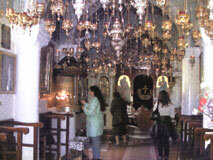 Next to it is the church of Stavrou which celebrates on September. 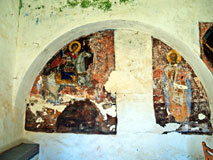 On the left is the Bacilica of Saint George the Catholic. Later on, the church was named Virgin Mary the Foritissa. As we continue, we see the Cathedral of Saint Dionisiou who was the bishop of the island from 1576 to 1579. The Saint lived in a cell which still exists. Southern, there is a small church which is dedicated to Santa Anne. Another church that we find is a domed Basilica which is built inside a rock. Further up and on the left from this church are the ruins of a castle which was built by the Venetians in 1654. From Saint Dionisio's cell, a path leads around the hill passing by the church of Saints Theodoroi and below that the church of Taxiarxon. The Monastery of Santa Kiriaki was the center of Palaioxora from the 12th century until 1830. Santa Kiriaki is a double Basilica with beautiful murals. Down the path to Santa Kiriaki is the church of Saint John the theologist with a blue dome and a blue bell-tower. A few meters away is the Basilica of Saint Nikolaos. The path goes up to the Basilica of Saints Anargiron. The church of Saint Dimitrios is on the right and higher up and the church of Virgin Mary is on the left and lower down. 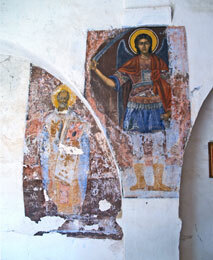 Above the path, is the church of Metamorphosis, whose murals have been saved. If you return to the main path, you will see the church of Saint George.